The Heavy Light BDS (Breathable Diving Suit) Kevlar has been developed especially for demanding surface rescue, professional and technical diving. The material is an extremely light three layer breathable fabric with Kevlar reinforcement making it comfortable both under the water and on the surface. Heavy Light Cordura FZ follows the same product development philosophy as its cousin the Heavy Light, and that is the suit has been designed to wear and perform equally as well out of the water as under. This durability is why so many militaries choose it as their preferred training suit. Click on the image for more info. Traditional Heavy Light Cordura FZ has a new model designed specifically for ladies. There has been special attention paid to female body form in the design as well as a two colour separation for the top and bottom of the suit. Otherwise the suit is made to the same specification as the male version. Heavy Light Cordura FZ follows the same product development philosophy as its cousin the Heavy Light, and that is the suit has been designed to wear and perform equally as well out of the water as under. This durability is why so many militaries choose it as their preferred training suit. Heavy Light FZ is the first and already legendary suit in the Ursuit dry suit series. It is manufactured of a very light three layer fabric. Despite the lightness, the durability is of the highest possible standard. The series of Heavy Light suits was started in 1992, when a tender from the Swedish Defence Forces was received to trial drysuits over a two year period. The result being the Heavy Light suit was chosen and it has been in service ever since. 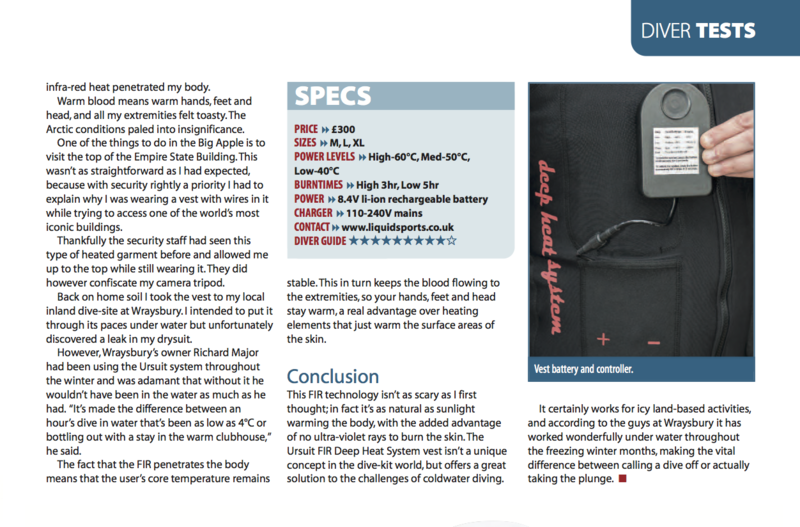 Despite its military background, the suit is a dream come true for the sports diver. Traditional Heavy Light FZ has a new model designed specifically for ladies. There has been special attention paid to female body form in the design as well as a two colour separation for the top and bottom of the suit. Otherwise the suit is made to the same specification as the male version. The two-piece Ursuit® Gemino Operative keeps you dry and on the water under all conditions, no matter whether your passion is fishing, boating, sailing or paddling. Ursuit® Gemino Operative line is designed for professionals in extreme conditions. Material: PTFE-based Gore-Tex®. Seam structure: patented seam structure, that is based on the Flat Seam-technology this avoids multiple layers. Neck and wrist seals: waterproof and warming Super Stretch neoprene Knee and back reinforcements. With integrated Gore-Tex® socks you can choose shoes that best fits your needs. Large, splash waterproof thigh pockets Side-opened front pocket in jacket Leg and wrist adjustments with reflective tape High collar that is lined with water resistant fleece and integrated yellow fluorescent hood. Braces in trousers. Waistband. Includes separate neoprene hood and gloves. In upper part of trousers pocket for phone. Includes carrying / storage bag. The two-piece Ursuit® Gemino Operative keeps you dry and on the water under all conditions, no matter whether your passion is fishing, boating, sailing or paddling. Material: four-layer 4-Tex®, that is breathable but still waterproof. Seam structure: patented seam structure, that is based on the Flat Seam-technology this avoids multiple layers. Neck and wrist seals: waterproof and warm Super Stretch Neoprene Knee and back reinforcements. Thanks to integrated 4-Tex® socks you can choose shoes that fits best for your needs. The two-pieces Ursuit® Gemino Operative keeps you dry and in the swim under all conditions, no matter whether your passion fishing, boating, paddling or rapid shooting is. Material: four-layer 4-Tex®, that is breathable but still waterproof. Seam structure: patented seam structure, that is based on the Flat Seam-technology. Because of this technology the multiple layers can be avoided. Neck and wrist seals: waterproof and warming Super Stretch Neoprene Knee and back reinforcements. Thanks to integrated 4-Tex® socks you can choose shoes that fits best for your needs. In upper part of trousers pocket for phone. Braces in trousers. Waist band. Includes separate neoprene hood and gloves and carrying / storage bag. Traditional AWS 4-Tex suit available in mens and ladies models AWS Active Watersport Suit is manufactured for paddling, dingy sailing and for other water sport activities achieved in a sitting position. The simple design concentrates on the most essential features: comfort and keeping dry, leaving out excessive details. 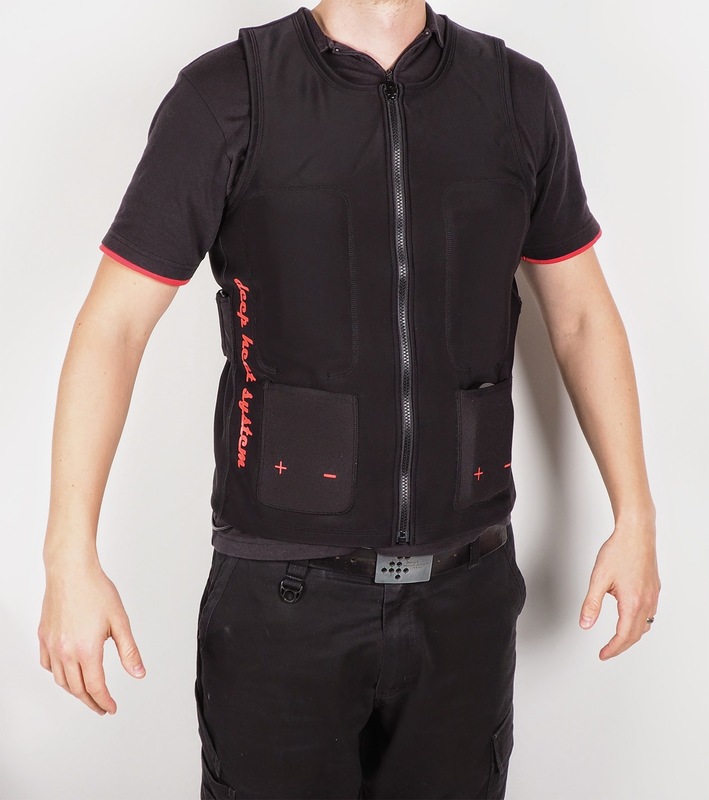 The suit design considers especially the different measurements of the back and the front parts, to achieve maximum comfort whilst in a sitting position. special model of the popular RDS Rapid Donning Suit especially made to meet the demands of the offshore industry. Collar structure is open, which eases dressing and enables ventilation in warm weather. Material: Gore-Tex® breathable fabric based upon the ePTFE membrane. Seam construction: double seams are heat seal taped and reinforced to be 100 % watertight. Reflective tape: The suit is equipped with reflective tape situated in propionate positions, which assures visibility in all conditions. The soft and durable reflective tape have been developed by 3M in accordance with the directive on marine equipment. Socks made of same fabric as the suit and enables use of any industrial footwear. Knee and back reinforcements made of hard wearing Cordura material. Hood: attached hood, which protects against wind and rain. Separate 3 mm neoprene hood, for protection against cold water. Gloves: integrated 3mm 5-finger neoprene gloves in sleeve pockets. Supplied in a carrying bag. Thermal Vest consists of a comfortable fleece vest, 3 thermal pads, battery and charger. 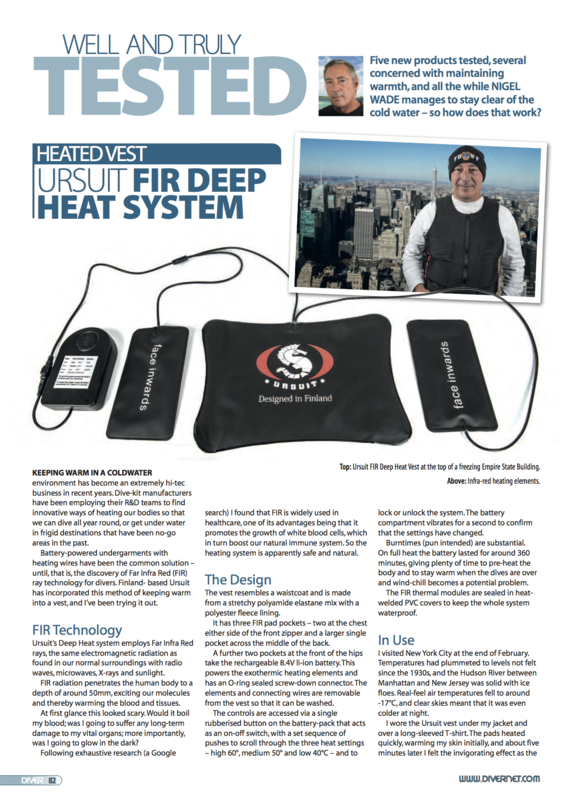 The heating power of the vest can be set to three different levels. Depending on the heat level, the battery lasts between 3-5 hours. The battery indicates heat level. The warming effect of the vest is based on FIR (Far Infrared Ray) radiation, which is an electromagnetic radiation. Electromagnetic radiation is a part of our natural surroundings (radio waves, microwaves, x-ray, ultraviolet light). The energy of FIR- radiation causes movement between the molecules of the receiving material. This movement creates heat in the human body. Warming on a human body lasts longer because “deepwarmth” is able to heat blood circulation and muscles.